When I was a young and impressionable kid, there was one lady down the road from us that took Halloween to the extreme each year. With her whole house decorated inside and out, she created her own haunted castle — complete with a boiling cauldron on the front porch where young visitors were encouraged to bob for apples. Of course, the steam rising from the kettle was really dry ice evaporating into the air. With her tall pointed black hat and sickly green facial makeup, that neighbor was the essence of Halloween — right down to the coarse straw broom leaning in the corner. 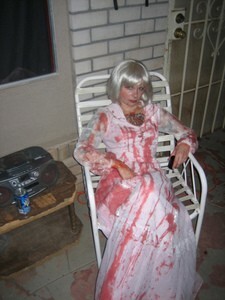 Whether you choose to play it up like she did or not, making your front porch and yard into the spookiest place in the neighborhood is easier than ever these days! 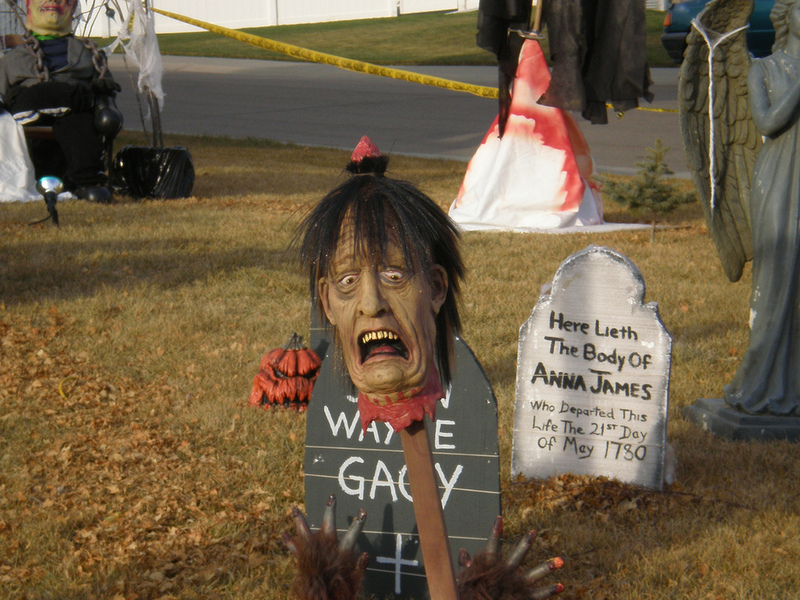 There are all kinds of neat Halloween items on the market that will add a spooktacular touch to your home. 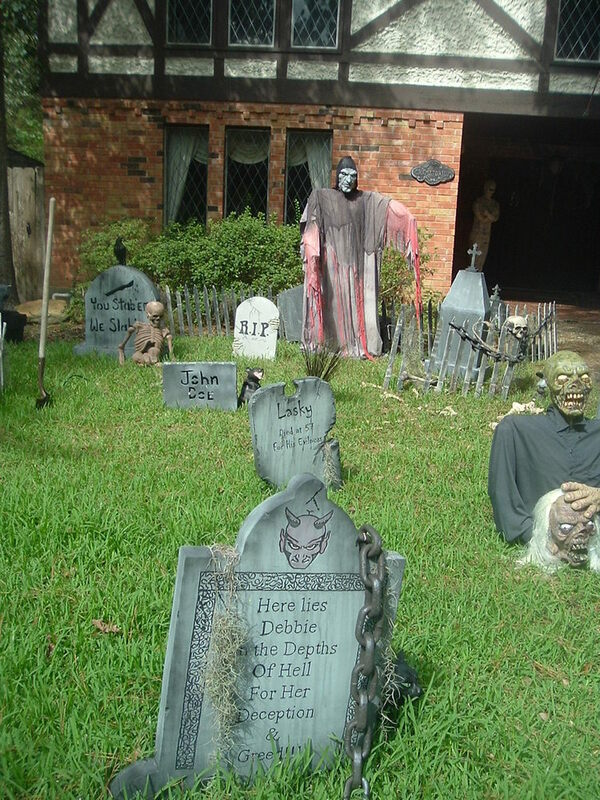 Following are some fun ways to decorate the exterior of your home for Halloween… with the intent to scare the daylights out of all visitors and neighbors! A pumpkin head scarecrow sitting on your front porch swing will set the mood. Make a recording of spooky music to play in the background and watch the kids quiver as they cautiously approach the front stoop. Yellow caution tape, like that used at crime scenes, is the perfect way to set up a pathway to direct Trick-or-Treaters to your dungeon of doom. Like guardrails on both sides of a walkway, zig zag the caution tape around the yard before delivering all visitors to your door. Jars of ingredients for a witch’s brew displayed on the same table as the actual Halloween treats to be dispensed will definitely get some attention! Consider some eyeballs, (painted ping pong balls), spiders (fake ones), as well as worms and assorted creepy crawlers (Gummy candies, or rubber imitations) — all designed to startle those expecting a tasty treat. Skeletons and chains always add a nice deceased touch to the Halloween decor. Having a remotely activated way to rattle the bones will surly send youngsters running for mom in a hurry! A graveyard, complete with headstones is a perfect way to accent that caution tape walkway. Let those arriving know what happened to those who came before! Rigging one of the tombstones with a flip-open casket and an accompanying ghost to jump out and surprise people is sure to make them scream! Create your own haunted castle entrance by stapling cardboard to a lightweight wood framework. Paint it with a can of flat black spray paint. For a very small investment, you’ve done a Halloween makeover of your whole entry. 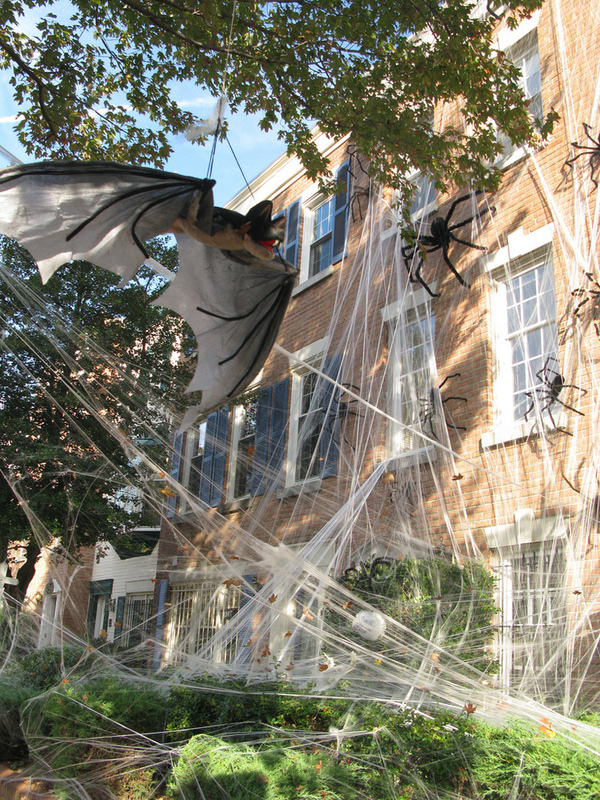 Spider webs are a must have for any self-respecting haunted abode. Just the feeling of having something in your hair or something rubbing against your face will cause people to jump. Spooky sound effects like creaking windows, slamming doors, wolves howling, or screams of terror will set the mood. Your visitors will shudder at every sound. A fog machine is a must! No Halloween porch or front yard cemetery would be complete without that low lying foggy mist rolling in to add a haunted touch. Is it your imagination?… Or did a ghost just come out of the ground by that grave on Boot Hill? The one with the head stone of Jesse James, or maybe it’s John Dillinger. Oh, just to be fair, I suppose there is the odd person in your neighborhood who doesn’t believe in scaring poor little innocent children when they come Trick-or-Treating. For them (and you know who you are! 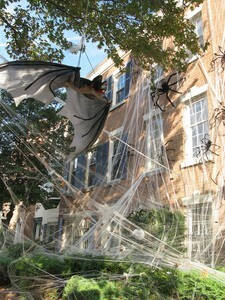 ), there are a few kid-friendly Halloween decorating ideas as well. Those will be unlikely to raise the eyebrow of even the smallest, most timid child.